Alabama House Speaker Mike Hubbard (R-Auburn) and state prosecutors have reached a plea deal that calls for Hubbard to receive an 18-month prison sentence in exchange for testimony about alleged corruption involving Gov. Robert Bentley, Senate President Del Marsh, and former Gov. Bob Riley, according to multiple reports in the Web press. 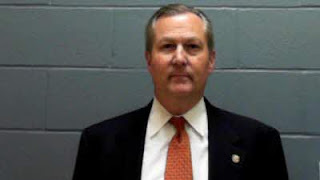 Hubbard will: (a) resign from public office; (b) plead guilty to public corruption charges; (c) agree to an 18-month sentence, 12 months of which will be served in the Lee County jail and 6 months of which will be suspended; and (d) be allowed to register as a lobbyist after serving his sentence. As part of his deal, Hubbard will cooperate with state and federal prosecutors investigating allegations of public corruption by Governor Robert Bentley, former governor Bob Riley, and Senate President Del Marsh. Our Facebook news team first reported on April 17, 2016, that early "street" reports of the deal had been confirmed, including the 18-month sentence. TheMeck.blogspot.com reported additional details of Hubbard's deal in its story. The Hubbard deal will be publicly announced after the legislature adjourns. The plea deal will be announced in open court on or before the start of Hubbard's scheduled May 16, 2016, criminal trial. Investigators are also looking into threatening statements made by State Representative Alvin Holmes (D-Montgomery) to fellow legislators last week to determine whether these statements rose to the level of criminal "extortion" under state law. Holmes threatened to "out" legislators who are engaging in extra-marital affairs if they voted in favor of the House's impeachment resolution against Bentley. Investigators believe Holmes may have crossed the line with his threat. Breaking reports tend to answer some questions, while raising others. Perhaps the major question raised here is: Why are federal investigators checking into Del Marsh and Bob Riley, what information can Hubbard give them, and will that bring even more prominent Alabama politicos into the fray? Here is an even better question: Will unlawful actions of Indian gaming interests be unearthed, and will that help explain much of the corruption Alabama has experienced over the past 20 years? Come to think of it, could this create a trail that leads to national political figures who have turned Alabama into a legal and political sewer (hello, Karl Rove!)? Sorry, but once you start thinking about all of the questions this raises, it's hard to stop. It's also hard to wipe the smile off your face at the thought of certain conservative crooks winding up in the orange jumpsuits they so richly deserve. David Meckley d/b/a TheMeck.blogspot.com, Yellowhammer News, theAlabama Political Reporter, Roger Alan Shuler d/b/a Legal Schnauzer.blogspot.com, and other online journalists continue to lead the state's news media by breaking all of the leading news stories relating to Alabama's high-profile public corruption scandals. Hubbard has the legal right to walk away from his plea deal at any time prior to its acceptance by the Court. If he does, his trial will go forward as scheduled.